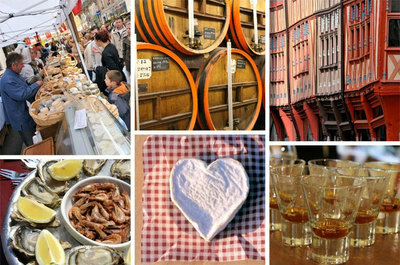 There are few things that the French enjoy celebrating more than food and drink, and Normandy is no exception. Visitors seeking a gourmet experience can enjoy a range of local specialities at the many foodie festivals taking place this autumn. One of the main apple growing regions in France, Normandy bases many of its traditional dishes (think apple tart) and drinks (think cider, calvados and pommeau) on its signature apples. With all the apple harvesting and cider-making that takes place in autumn, visitors will certainly have their pick of festivals celebrating all things apple. With its extensive coastline, seafood is also one of Normandy's specialities. Fish and shellfish feature on most menus, and autumn is the best time to sample scallops (coquilles Saint-Jacques) from Port?en-Bessin, oysters from the Cotentin peninsula, shrimps from Honfleur and herrings from the Alabaster Coast. Just an hour away from the Mont-Saint-Michel, Granville is France's number one shellfish port and is known to the French as “the Monaco of the North”. Its popular seafood festival, Toute la Mer sur un Plateau (The Whole Sea on a Plate), attracts around 55,000 visitors a year, and no less than 16 tonnes of seafood are brought fresh off the fishing boats for the occasion. The festival boasts markets, pop?up seafood restaurants, cooking demos, free tastings, folk music and entertainment for all the family. For more information, click here. Two hours from the port of Ouistreham and 90 minutes from Le Havre, the Apple, Cider and Cheese Festival in Conches has become quite the event in Normandy. This year's anticipated 35,000 visitors can expect a farmers market, tastings, cooking demos, folk music, regional cider, honey and gingerbread, traditional Norman games and an abundance of pop-up restaurants serving Norman specialties. For more information, click here. Every November, the Alabaster Coast celebrates one of its most popular products: the herring! For a whole month, herring festivals are held one after the other from the port of Le Havre all the way up to Dieppe. Fresh herrings are smoked, grilled or marinated, and enjoyed with a white wine, beer or the regional aperitif, Kir Normand. Fish markets, barbecues and live music on the quayside make for a day out with a difference. Travelling to the Alabaster Coast is easy, with regular sailings to Le Havre and Dieppe from Portsmouth and Newhaven. For more information, click here. A popular festival that has run for ten years, the Tree and Apple Festival takes place at the EcoMusée in the Perche Natural Regional Park, 90 minutes from Ouistreham and two hours from Le Havre. This year's vintage promises cider galore, with tastings, cider?making demos, as well as farming workshops for old and young, arts and crafts, and even gardening. For more information, click here. This festival provides ample opportunity to celebrate in true maritime tradition! Every November, Le Goût du Large (A Taste for the Open Sea) festival celebrates the return of scallops to the fishing village of Port-en-Bessin, situated 20 minutes from Bayeux in the middle of the famous D-Day Beaches. Highlights of the festival include tastings, sea shanties and an array of scallop dishes on offer at local restaurants. To mark the occasion, the wholesale fish market will be open to the public, so visitors can buy freshly caught scallops to take home. For more information, click here.